RIM's tablet to hit in June? Will the UK have to wait until June to get its mitts on the PlayBook? 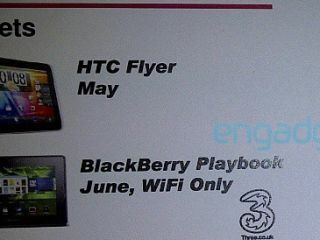 Some leaked Three-branded slides suggest that the BlackBerry PlayBook UK release date will be coming in June 2011. RIM, which revealed its first tablet efforts in September, is set to launch the PlayBook in April in the US. UPDATE: RIM has confirmed the BlackBerry PlayBook US release date as 19 April, with a starting price of $499. An official UK release date has not been revealed, and Three's slide states that it's the Wi-Fi only model that will be available in June. We can also assume that Three will be ranging the RIM tablet, although talks may not yet be finalised if the release date is so far in the future. The leaked slides, which were sent to Engadget, also list the HTC Flyer for a May release and outs the Samsung Galaxy S II Mini, a variant of the Galaxy S II which is yet to hit the UK's shelves. A June launch will put the PlayBook a good three months behind Apple's iPad 2, as well as taking on competition from the bevy of Android tablets set to launch between now and then – including the highly-rated Motorola Xoom and HTC Flyer.